Lazaris Apartments is located at Agios Ionnis of Lefkada , one of the most beautiful beaches of the island, just 3km from the centre. 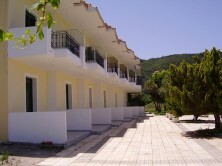 Built in a unique spot, in front of the golden sand of Agios Ioannis, promises its guests serenity and relaxation. Its location allows guests a magnificent view, a much talked about sunset while the sea breeze cools them down and makes the Agios Ioannis beach one of the most favorite destination for windsurfers and kitesurfers from all over the world. Our ultimate goal is to make your stay as pleasant as possible! Lefkada is the only island that is linked with the mainland by a floating bridge. Idyllic and rugged landscapes combine harmoniously. Wide, golden beaches ranging among the most beautiful of the Mediterranean Sea, with the most famous Porto Katsiki and Kathisma, ideal destinations for windsurfing and kitesurfing, like the Agios Ioannis beach, picturesque little bays, shades of emerald and blue, a colorful cluster of little islands, imposing mountains and monasteries, traditional villages and popular resorts await the traveler. The small coves, the little islands and the turquoise waters makes Lefkada a favorite anchorage for yachts.